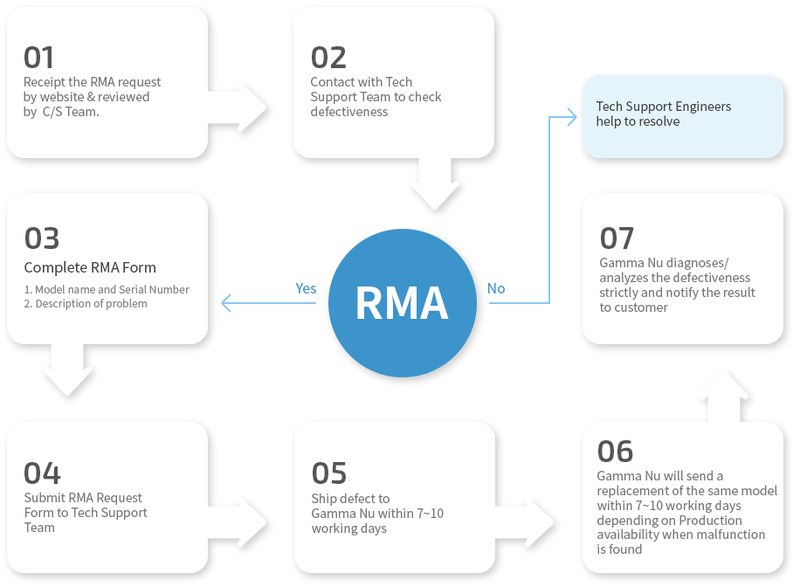 We are highly pleased to inform you of RMA Instructions which contain all details each step to proceed with. When filling out the request form, please provide complete contact information as well as detailed descriptions of the item malfunction. It is not sufficient to state that the item "does not work". If you are uncertain about the cause of the problem, please contact a technical support engineer at Gamma Nu. The engineer may be able to resolve your issue without requiring you to send your product in for repair. Please send only the device itself and do not include any accessories such as manuals, cables, etc. If you believe the accessories may be part of the problem and wish to include them, please indicate this clearly in your request. Otherwise, Gamma Nu will not be able to guarantee that your accessories will be returned. Make sure that you include a printout of the RMA request form with your item when you ship it to us. You are responsible for any shipping charges when sending your item to Gamma Nu. We will cover any shipping charges when returning your item back to you. On your shipper's invoice, be sure to write the following: "Goods with no commercial value are being returned for repair." Without this note, additional charges will be levied by customs, which you will be responsible for. Charges may be incurred for certain repairs. Gamma Nu will charge for repairs to products whose warranty period has expired. Gamma Nu will also charge for repairs to products if the damage resulted from acts of God, environmental or atmospheric disturbances, or other external forces through misuse, abuse, or unauthorized alteration or repair. If charges will be incurred for a repair, Gamma Nu will send a "Pro Forma Invoice" that lists all charges, and will wait for your approval before performing the repair. The turnaround time for diagnosis, repair, and return can vary from a few days to a few weeks. If you are in North or South America, please contact gnt.sales@gammanu.com for estimated turnaround times. If a refurbished replacement product is available, it can be shipped within a few days. Repaired items will be returned by priority mail. You may request a private shipping service such as UPS or DHL, but you will be responsible for any additional costs. If you require any special shipping arrangements, please indicate this clearly when shipping your item to Gamma Nu. Contact our customer service at support@gammanu.com if you need further assistance. and contact the customer if our technical support team is able to resolve the problem immediately. Otherwise, RMA will be issued. 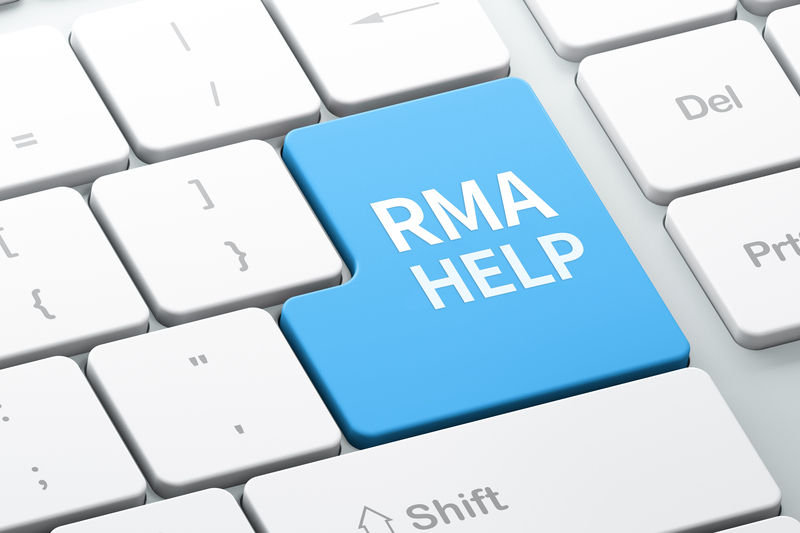 RMA number will be validated for 10days from issuance date. Customer must pack and send the merchandise freight pre-paid to Gamma Nu. c/o Gamma Nu Theta Inc.
Gamma Nu will diagnose/evaluate the returned product to determine if returned products are defective or operable. Upon completion of the evaluation, Gamma Nu will contact Customer either through e-mail or phone with the results of the evaluation. In case of no trouble-finding, the shipper will bear accrued expense. Please verify the information on this form and provide additional comments if necessary.